What an excellent series. I really loved each book and am so looking forward to reading the next two. Keep on keeping on Felicity you are an amazing author. Thanks. I usually enjoy ms Heaton's story telling, but this was written as if she was paid by the word. The rest of the series has been fun but this was just a waste of time and space. 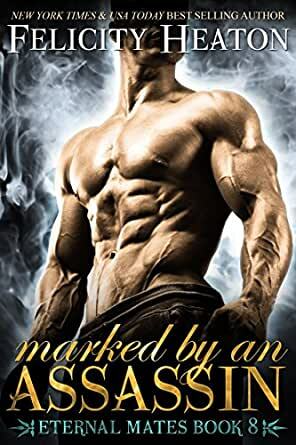 Driven by vengeance, Harbin treads the dark path of an assassin but his newest mark isn’t quite what he expected and the beautiful snow leopard awakens a fierce hunger inside him in this pulse-pounding paranormal romance. There is never a dull moment to be found in this story and I have to say that there was so much going on that I couldn’t believe I had read it that fast, I didn’t want it to be over, but as I looked at the clock, I realized that I had just been so caught up in the story that I had no idea that much time had passed…I guess it’s a good thing everyone can fend for themselves around here. It's no secret that I'm a bit of a paranormal junkie - I love the genre and Shifters in particular, so this installment of the Eternal Mates series was right up my street!! I have a real love of the world that Felicity Heaton brings to life in this series. Her layering and world building makes it easy to picture in your mind the scenes in the book as they play out. There's an overlap of other stories that can be found in each book, it's subtle but ties together very nicely and gives you a 'Oh yeah, that happened in xxxx's story' moment when you are reading. For me, this continuity and the consistent timelines that Felicity threads through the books all add to the story arc. Marked by an Assassin is Harbin and Aya's book. Both are snow leopards living far from their homeland but they have a connection - in more ways than one!! The Assassins Guild that Harbin works for has been hired to hunt down and kill a snow leopard, a task that our hero makes sure he gets to take on as he is intrigued as to what the shifter has done to warrant the hit. At first, he doesn't recognise Aya as one of his pride as he's been gone from his village for two decades after being used and duped by an Archangel huntress. He has become hardened and cold since the events all those years ago and is determined that he will carry out his job and it'll be nothing more than another assignment, even though the mark is another snow leopard, but when he encounters the female things don't go quite to plan. Aya lives in London, keeping her head down and flitting among the fae, and has done since not long after the night the Archangel team decimated her village and killed their kin. She seems to be a mark in this game but as things progress Harbin stats to wonder, is she as innocent as she seems or is there more going on that at first glance? The story is action packed as you'd expect from Ms Heaton. There are secrets and lies, betrayals, a deep need for revenge on both their parts but is it for the right reasons? The connection and chemistry between our leads is obvious pretty much from the start though it takes one of them a little longer to realise what's going on and when the penny finally drops they have to make some tough choices and decide what they should do for the best. Another great read and addition to the Eternal Mates series. I can't wait to see what happens next!! For me it's a 5* read! Back the full story up when the assassins (Hartt, Fuery, & Harbin) suddenly appear at the dance club Underworld which premiered in Loke & Anais story, Taken by a Dragon; this is a meanwhile story that overlaps another couples stories. Harbin is Cavanaugh's younger and only brother. Harbin is mentioned before in previous books of this series. Harbin does something foolish and is exiled from his snow leopard pride and this sets him on the road to vengeance and shapes him to become an assassin. Hartt is an elf that is founder & Chief of The Assassins Guild. He recruits Harbin and allows Harbin to focus his rage and hone his skills. Aya has always been Harbin's fated female and even at a young age, this knowledge scares her. Her fear confuses young Harbin and pushes him to be reckless. Given a second chance through fate, the two lovers get their chance to rekindle their need to mate and become one. But using one of them as bait to lure their prey so they may get their revenge, this offense is what settles their chaotic feelings & reveal their love for one another. Fascinating! Another well written episode in a wonderful series. When hunters destroyed his village killing his mother and sister Harbin leaves behind not only the father that banished him but a brother he believes to black!e him for the loss of their people. Captured, tortured and lied to, Aya now lives in the world of mortals. Helping Archangel, she doesn't know the truth behind what happened twenty years ago. But she does find the one to blame. Now two enemies must join forces and fight a long standing bond so they may finally have the justice to set the past to rest. I can't keep my hands off that one click button when it comes to Felicity Heaton's work! I doubt anyone else can either! I really liked this book. He is exiled and becomes an assassin. She unwittingly works for Archangel, the organization he believes slaughtered his family. Add in elves, demons, and the odd witch and you have a good tale of intrigue! This was a fantastic story! The characters truly made this story and the audio version brought them to life and filled them with personality. This series was such a great find for me, I have purchased and enjoyed each tale, this book like all the others in the series offers action, adventure, alphas, and always a pleasure filled journey to their HEA.